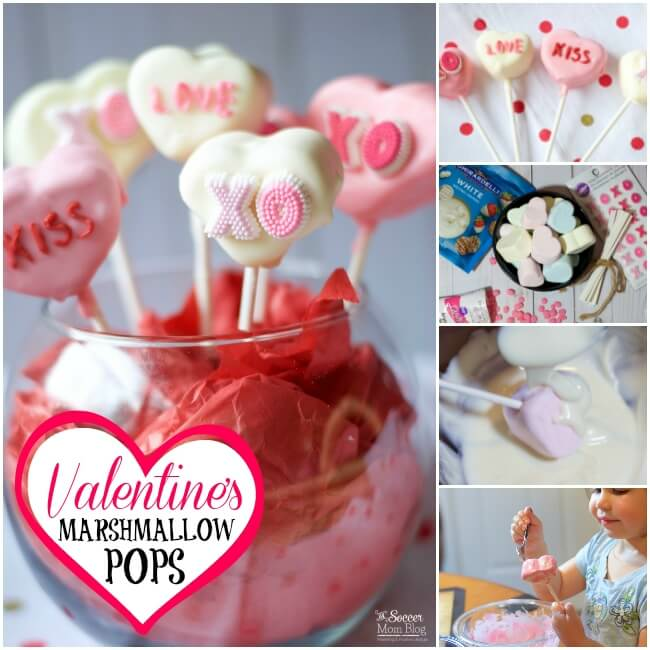 Chocolate-dipped Conversation Heart Marshmallow Pops are easy enough for kids to make and absolutely adorable Valentine’s Day gifts! 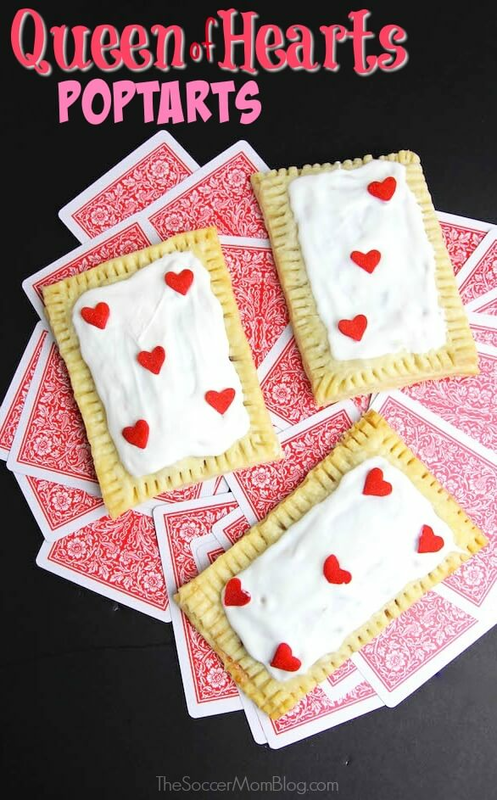 Every year leading up to Valentine’s Day, the girls and I like to create special treats. 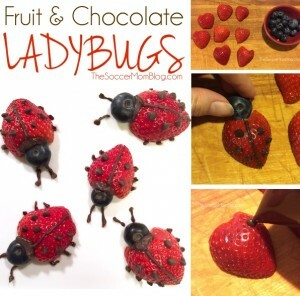 (Last year we made these cute and healthy Strawberry Ladybugs). 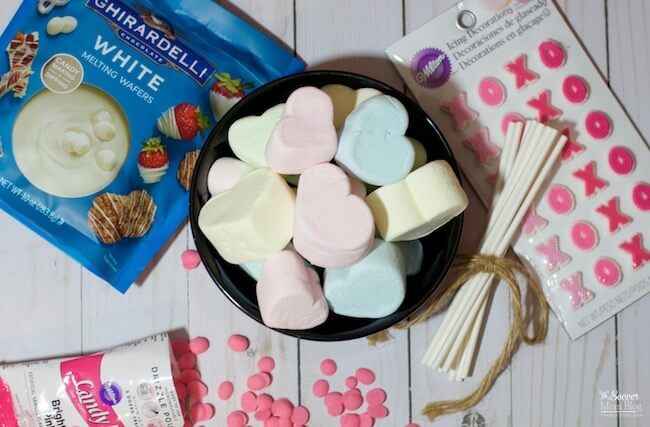 At the store recently, we saw a bag of jumbo heart-shaped marshmallows and were inspired to make these festive Conversation Heart Marshmallow Pops. 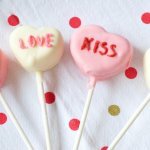 Our Conversation Heart Marshmallow Pops turned out even prettier than I imagined, and the girls had an absolute blast making them! We kept it simple with two color coatings: pink and white. However, the sky is the limit and these would look adorable in a rainbow of colors too! 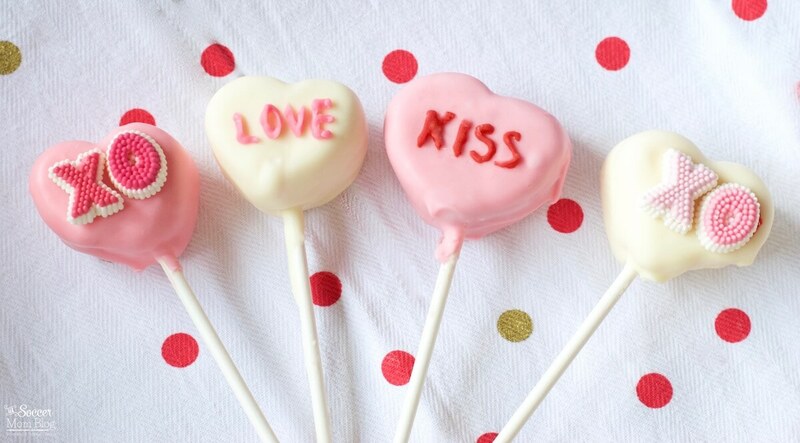 Wouldn’t these make the perfect kid-made Valentine’s Day gift for family, classmates, and teachers? We’ve provided shop-able ad links for your convenience in locating the items used to make this recipe; read our disclosure policy here. Keep reading for photo step-by-step instructions and decorating tips! Free printable copy of full recipe available at bottom of post; click here to jump to printable recipe. If making these pop yourself, you might want to do the pink chocolate and white chocolate separately, so they don’t harden halfway through. Since the girls and I all worked together, we made all the chocolate at once so there was plenty to go around. You can use a double boiler to melt the chocolate, or melt in the microwave. If doing the latter, be sure to use a microwave-safe bowl, stir every 15-20 seconds, and handle with care – bowl and contents may become hot. We used a spoon to help cover the entire surface of the marshmallow. After marshmallow is fully coated, slowly spin over the bowl so excess chocolate will drip off. 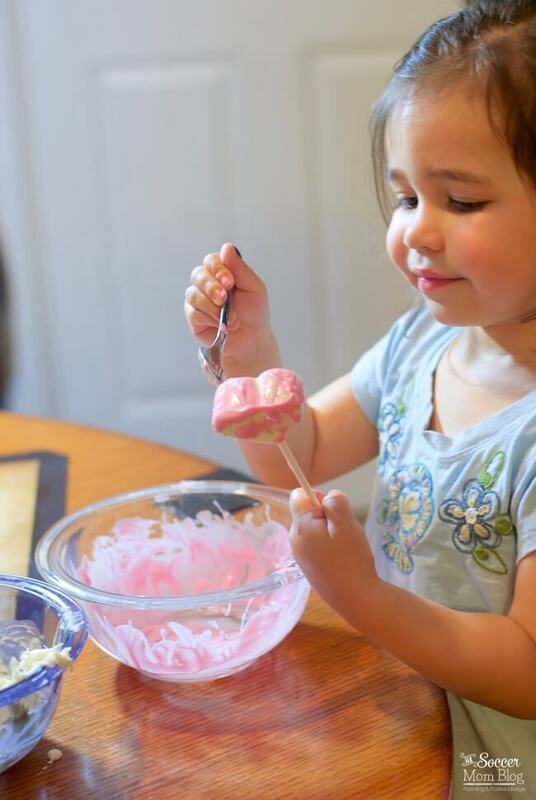 This project is great for kids of all ages – as you can see my three year old daughter made her very own marshmallow pops! Tip: Make sure to allow chocolate coating to dry completely before decorating. 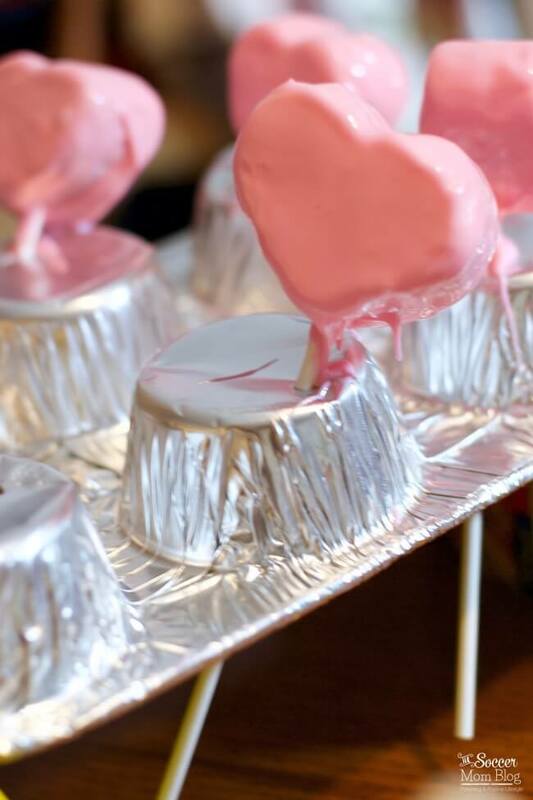 We used an extra aluminum muffin pan to hold our marshmallows upright to dry. Simply poke holes into the bottom of the cups, turn upside down and use two books to hold the muffin pan a couple inches above your workspace. (We saved these pans for future projects). 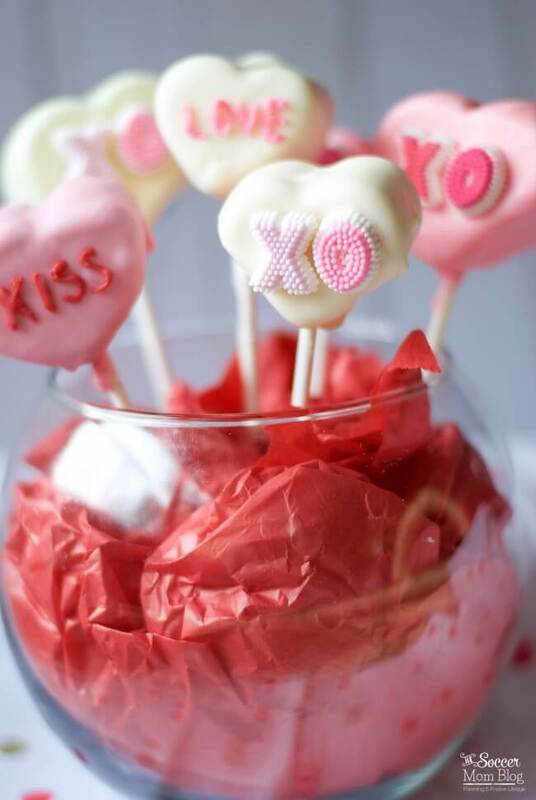 Chocolate-dipped Conversation Heart Marshmallow Pops are easy enough for kids to make and absolutely adorable Valentine's Day gifts! 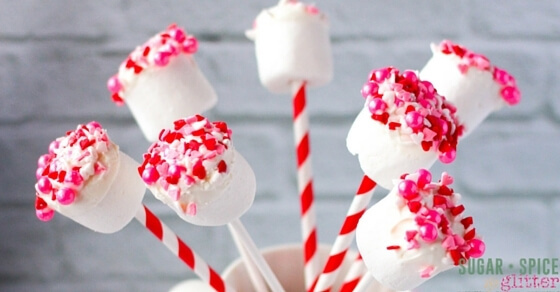 Push candy sticks through marshmallows, starting in the middle of the bottom point. The sticks need to be almost completely through for stability, but take care not to push the stick out the top. Prepare white and pink melting chocolate according to directions on package. (We started with two bowls of white chocolate pieces and added the bright pink candy to one bowl to create a light pink when melted/mixed). 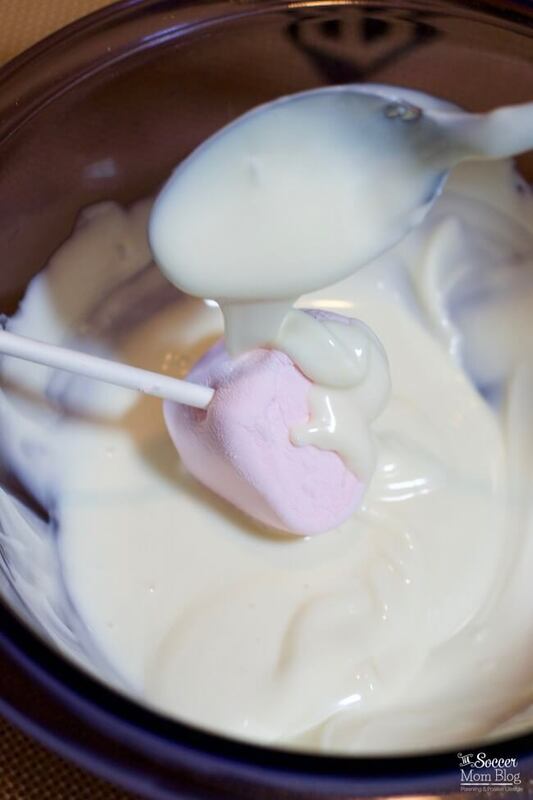 Dip marshmallows into melting chocolate and gently turn to coat. We used a spoon to help cover the entire surface of the marshmallow. After marshmallow is fully coated, slowly spin over the bowl so excess chocolate will drip off. Allow chocolate coating to dry completely before decorating. We used candy decorating bags and red and pink melting candy to write short Valentine's themed words on our pops. Attach icing decorations (like the "XO" ones we used) by putting a drop of melting chocolate on the back of the candies as "glue."